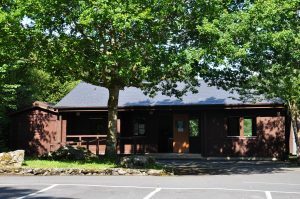 The free-to-enter Visitor Centre, which houses a small exhibition reflecting the nature of Dromore Wood, is open during the summer months. There are seven waymarked walking trails of varying length up to 6km. See below for Walking Trails Information. The only requests are that dogs are kept under control, litter is taken home, that the flowers and plants including fruits and nuts are not disturbed, that the peace of other visitors is respected and, for safety reasons, visitors should keep to the paths. Take the R458 (Gort Road) North in the direction of Barefield. Turn left for Ruan onto the L4162 (signposted for Dromore Wood and Ballyallia Lake). Stay on this road for 7.8km until you reach the Village of Ruan. In Ruan turn right in the village onto the school road (signposted for Dromore Wood Nature Reserve). After 600m, turn right at the crossroads onto the Crusheen road (signed for Dromore Wood Nature Reserve). Stay on this road for 2.5km the entrance of the Nature Reserve is on the right. Take the R476 (Ennis Road) South for 1.4km. Turn left onto the road (signposted for Ruan). Stay onto this road for 5.5km until you reach the Village of Ruan. In Ruan turn left onto the school road (signposted for Dromore Wood Nature Reserve). After 600m, turn right at the crossroads onto the Crusheen road (signed for Dromore Wood Nature Reserve). Stay on this road for 2.5km the entrance of the Nature Reserve is on the right. Leaving Gort take the M18 South for 16.4km. Take the exit signposted for Crusheen (Exit 15). Before Crusheen Village, take the 3rd exit at the roundabout signed Barefield (R458). Stay on this road for 1.2km and then take the first right signposted for Dromore Wood Nature Reserve. Stay on this minor road (L8156) for 4km. The entrance to Dromore Wood Nature Reserve will be on your left. Travelling North along the M18, take the exit signposted for Crusheen (Exit 15). Before Crusheen Village take the 3rd exit at the roundabout signed Barefield (R458). Stay on this road for 1.2km and then take the first right signposted for Dromore Wood Nature Reserve. Stay on this minor road (L8156) for 4km. The entrance to Dromore Wood Nature Reserve will be on your left. They are two parking areas both found at the Visitor Centre/Trailhead in Dromore Wood. They are located 2km from the entrance. From the entrance gate follow the unmarked road for 2km. There is a small car park on the left and further down on the right there is a larger car park at the visitor centre. In the large car park there is a map board showing all the walking trails, information and a walking trails map can be found in the visitor centre (open seasonally). They are seven way-marked walking trails in Dromore Wood Nature Reserve to suite a range of abilities. The Nature Reserve’s main car park is the starting point for all the walks. It is recommended that you should wear strong shoes for the Rabbit Island and Castle Trail and walking booths for the other trails which go through more uneven rough forest paths. See below for each of the trails description. A 1.5km looped walk the trail is relatively flat with a gravelled surface. This walk passes through areas of mixed deciduous and conifer woodland, regenerating ash/hazel woodland, reed beads and has access to the shoreline of Dromore Lake (seasonally) where there is a fantastic view point of the Castle, Lake and Woodland. There is also access to the Black Lake on this trail which is great for viewing waterfowl particular in winter and spring. This trail also has three stone seating areas along the walk. The Rabbit Island Trail starts 100 meters from the main car park at the boat key. At the boat key go over the small bridge this will bring you onto Rabbit Island and the start of the loop. There are currently no markers on this trail stay on the gravelled path and this will bring you along the loop. A 2km looped walk this trail is on a mixture of uneven forest trail paved and graveled path. The walk passes through areas of mixed deciduous and conifer woodland. This trail is particularly interesting as it passes by some mature Wych Elm trees which have seeded profusely along parts of the trail. This trail also has a bat hibernaculum, diverse wildflower woodland edges and a fantastic view of the Castle Lake. This trail also passes by Dromore Castle at the end of the Loop. This trail is marked with white arrows. From the main car park start at the map board and walk onto the road where you will see the first white marker pointing left. A 2.3km transverse walk this trails starts at the main gate entrance and follows uneven woodland track, gravelled and paved pathway ending at the visitor centre and main car park. This trail has a mixture of mature beech woodland, conifer planation and mixed deciduous woodland. From the map board at the main gate follow the navy arrows along the trail. A 2.7km looped walk one of the most popular trails in the Nature Reserve. This trail passes through, mixed deciduous woodland, a small area of conifer woodland, reed beds, calcareous grassland, limestone outcrops and has access to Dromore Lake and Lough Garr. Some points of interest on this walk include; Dromore Castle, Castle Well, Ruined 16th/17th Century House, viewpoints of Dromore Lake and mature specimens of Oak, Ash, Beech, Lime, and Horse-Chestnut Trees which are over 200 years old. From the Visitor Centre this trails starts at the Blue Sign called Castle Trail. Follow the light blue arrows and brown boards to complete the loop. This trail is on gravelled and forest paths. A 3.5km looped walk that goes right through the middle of the woodland. This walk is on a mixture of forest, gravelled and paved pathways. This trail passes through, mixed deciduous woodland with a small area of conifer woodland, regenerating oak woodland and views of Dromore Lake. This trail also passes by Dromore Castle at the end of the Loop. This trail is marked with green arrows. From the main car park start at the map board and walk onto the road where you will see the first green marker pointing left. A 4.3km looped walk that goes through mixed deciduous woodland, conifer woodland, diverse wildflower woodland edges and views of Dromore Lake. This trail is on a mixture of forest, gravelled and paved pathways. This trail also passes by an area of old farm walls, ruined structures and Dromore Castle. This trail is marked with red arrows. From the main car park start at the map board and walk onto the road where you will see the first red marker pointing left. 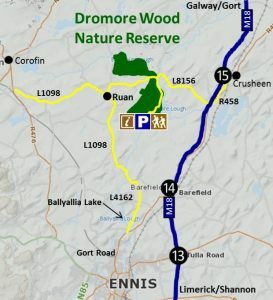 This trail is a 6km looped walk that goes through mixed deciduous woodland, conifer woodland, mature beech woodland, reed beds, calcareous grassland, limestone outcrops and has access to Dromore Lake and Lough Garr. This trail is on a mixture of forest, gravelled and paved pathways. Some points of interest on this walk include; Dromore Castle, Castle Well, Ruined 16th/17th Century House, Kilakee church and viewpoints of Dromore Lake. This trail is marked with purple national loop arrows. From the main car park start at the map board and walk onto the road where you will see the first purple marker pointing left. The Nature Reserve is free to access and open all year to the public. The Visitor Centre is open seasonally between May and August. Last Sunday in October to last Sunday in March – 6.00 pm to 8.00 am. Last Sunday in March to last Sunday in October – 7.30 pm to 8.00 am. Lyme disease, or ‘Borreliosis‘, is a bacterial infection passed to humans through a tick bite. Ticks are tiny spider-like creatures with three life-cycle stages, the smallest of which is about the size of a pinhead. They are frequently found in woodland, moorland and other grassy areas, where they feed on the blood of mammals and birds. They are usually found close to the ground, especially in moist, shaded areas. They attach themselves to the host for up to a week and swell as they feed. The first symptom of Lyme disease is often a rash (erythema migrans) that can appear 3 to 30 days after the tick bite. It starts as a small red dot at the bite site but may grow larger with time. The centre of the spot often fades creating a characteristic “bull’s-eye” appearance. Other symptoms include fever, chills, headaches, stiff neck, fatigue, muscle aches and joint pain. Occasionally, a severe form of Lyme disease can develop and the heart, joints or the nervous system can be affected. Walk in the middle of paths/trails, avoid overgrown vegetation. Wear shoes, not sandals or bare feet. Wear long trousers tucked into socks or boots. Consider using an insect repellent containing DEET. Follow the manufacturers’ application guidelines. Wear white or light coloured clothing to make ticks more visible and inspect clothes every 3-4 hours. At the end of your day out, check yourself (and your children) for ticks. Check both skin and hair, particularly warm moist areas such as the groin, backs of knees, armpits and neck. Pay particular attention to the head, neck and scalp of children. Check your pets for ticks after outdoor activities too. Firstly: don’t panic! Ticks need to be attached for 24-48 hours before infection takes place. There may be a bit of redness and swelling after this. This is normal. However, if a rash or other symptoms develop, a doctor should be contacted.